Cooks foods 3 to 10 times faster than ordinary cooking methods, saving time, energy, and money! High-speed pressure cooking preserves flavors and nutrients. Cooks chicken, fish, meat, and vegetables to perfection, even tenderizes economical cuts of meat. Long-lasting stainless steel with tri-clad base for quick, even heating and easy cleaning. Multiple protective features include independent pressure release devices that prevent excess buildup in the cooker and a cover lock that keeps the cooker from being opened until pressure is safely reduced. Stainless steel rack included for cooking several foods at once with no intermingling of flavors. Includes easy-to-follow instructions and delicious recipes. Ideal for use on gas, electric, smooth-top, and induction ranges. Fully immersible and dishwasher safe. 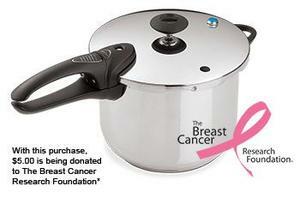 *The Breast Cancer Research Foundation is a registered trademark of The Breast Cancer Research Foundation.